While the timeline can vary, most applicants have to undergo procedures described below. Provided that the petition was submitted as appropriate, U.S. Citizenship and Immigration Services will accept it and notify you about the beginning of its processing by sending a Form I-797C. Usually, it is mailed within 2-3 weeks of the date of submission. However, an applicant can get a rejection from the agency, if he or she failed to forward the petition in line with USCIS requirements. On the other hand, in case of mistakes made when submitting the petition, the agency can mail a Request for Evidence, asking the applicant to provide additional papers. In any case, the process of obtaining the approval will be dragged down, and that’s why it is critical to have the petition filed correctly, including collecting all necessary papers. Note: The notice sent to you has a receipt number you should save, since it is required for checking your case status through USCIS website. In case you didn’t get the letter after a couple of weeks following the submission, feel free to make an inquiry via the website. According to statistics, USCIS rejects about 9 per cent of the petitions with much more of them denied. While poor document preparation ends in delays and even nasty problems with applicant’s current status, our step-by-step guide on Form I-130 submission helps eliminate those troubles and ensures that your papers will be accepted by U.S. Citizenship and Immigration Services. Actually, USCIS defines different categories of relatives, and this the key to understanding how your application is handled and when it will be approved. Immediate Relatives and Family Preference are 2 basic groups, and you are lucky if falling into the first one. It covers minor children, spouses and parents of an American citizen, meaning that their petitions are processed in the first turn. Since the number of visas for this group is not limited and the agency starts reviewing them with all possible dispatch, it takes less time to get the approval. Though all other applicants fall into another group and as a rule they have to wait longer for the USCIS decision, the application response time can still vary. First, it’s a matter of priorities within the group. For instance, unmarried sons and daughters of an American citizen have a higher priority than those relatives of a permanent resident. Another factor to keep in mind is a limited visas quantity. Sometimes, the agency can start reviewing Family Preference applications immediately upon receiving them, but if there is a backlog, the process will be postponed. 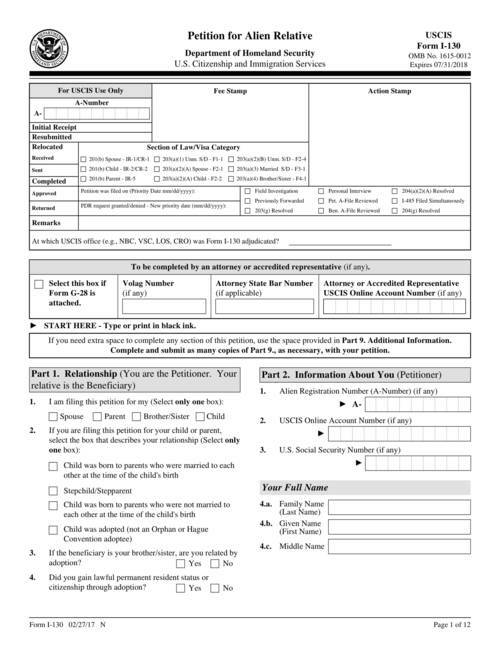 Nevertheless, an applicant’s place in this waiting list doesn’t depend on the date when his/her application was reviewed, but on the date when the documents were submitted (provided that this was done properly). Note: If within this waiting time either a petitioner or a person applying for the card happened to relocate, they need to inform the agency about the change of post address at 1-800-375-5283. As was already mentioned, any relatives except for minor children, spouses and parents of an American citizen fall into another group, while the listed applicants can enjoy an unlimited amount of visas available for them, as well as faster application response time. Though this is not always the case, they can obtain the approval in 5-9 months after they forwarded their papers to USCIS. If a person applying for the card resides in the United States and submits an application to adjust status, the application will be handled by USCIS after issuing the approval for Immediate Relatives. If the person resides in other country, the approval will be passed to the National Visa Center for further arrangement of an interview at a United States consulate in the home country. From this point, the applicant will proceed according to adjustment of status timeline. Since the quantity of visas for this type of relatives is limited, getting your petition reviewed and approved by USCIS doesn’t imply obtaining your green card right off the bat. Usually, Family Preference applicants have to wait for available immigrant visas, proceeding in the waiting list based on their priority dates (i.e. the date when the petition was forwarded to USCIS). Virtually, this means that an applicant from F1 category (the highest priority within the group) can get the approval as soon as in half a year, yet his/her application won’t be passed to a United States consulate until there is a visa number available for the applicant. Besides, keep in mind that for other Family Preference categories (with a lower priority), it will take a great while to get the approval. Anyway, once the approval is obtained, the applicant can keep track of his/her status via Visa Bulletin published on U.S. Department of State website. Note: Again, mind you inform USCIS about a change of post address, if any. The amount of visas that can be issued for foreign relatives of American citizens and lawful permanent residents are regulated by Congress and cannot exceed the limit set annually. When coupled with limits also set for various countries, this results in a long waiting list for certain groups of applicants seeking to obtain their green cards. Since the waiting time can be very extensive, it is critical to get on the waitlist as early as possible. And it’s worth to remember that USCIS will put an applicant on the waitlist within each category in the order of application submission. Obviously, if an applicant fails to file his/her petition in a proper manner, this will lead to delays preventing the applicant from getting USCIS approval early and thus from registering for the waiting list and earning the green card, too. Note: Make sure to use online tools offered via USCIS website, such as checking case status or processing times. If there is a delay with your case processing, feel free to make an inquiry. Also take into account that earning Form I-130 approval is only an early stage of your journey that involves further steps you should learn about.